Atlas ACFoam products are among the most sustainable and widely used building insulation materials available today. All Atlas ACFoam polyiso insulation boards are QualityMark™ certified, providing consumers an easy way to identify premium products that meet or exceed building codes for the best in roof performance. ACFoam delivers unparalleled performance and energy efficiency that’s built to last. ACFoam®-II is the signature ACFoam product from Atlas and features non-asphaltic, fiber-reinforced organic felt facers. These organic facers are integrally bonded to a closed-cell polyiso foam core available in a variety of thicknesses. learn more. ACFoam®-III features inorganic coated glass facers, which have a significantly more efficient use of solvent-based adhesives than organic faced insulations. 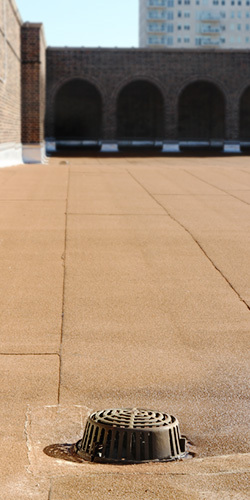 Typically specified for use in new and re-roofing applications, Flat and Tapered ACFoam-III is used in built-up (BUR), modified bitumen, metal, ballasted single-ply, mechanically attached single-ply and adhered single-ply roofing systems. learn more. ACFoam® Supreme is equipped with reinforced foil facers that provide increased dimensional stability as well as decreased potential for water absorption and water vapor transmission. These reflective tri-laminate foil facers are integrally bonded to a closed-cell polyiso foam core available in a variety of thicknesses. learn more. ACFoam®-HD CoverBoard was developed with the same inorganic coated glass facers as ACFoam-III. ACFoam-HD CoverBoard facers are bonded to a high-density polyiso foam core that offers increased dimensional stability and roof system protection in a lightweight and easy to handle rigid polyiso construction. learn more. ACFoam® Recover Board is manufactured and tested for use in recover applications, ACFoam Recover Board is a rigid polyiso roof insulation faced with inorganic coated polymer-bonded glass fiber mat facers. Recover Board is a thermally efficient and dimensionally stable recover board solution. learn more.